Xperia Z1 Compact aka Xperia Z1C Priced in Europe UK £449, France Netherlands and Spain €549, Italy and Germany €499, Sweden 4695 kr, Poland 1999 zł. 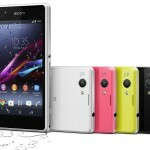 Within one day of launching Sony Xperia Z1 Compact aka Xperia Z1C at CES 2014 Las Vegas, Sony has officially priced Xperia Z1 Compact in Europe and is available for pre-order now. Xperia Z1 Compact is the 4.3″ miniature version of mighty Xperia Z1 featuring the same hardware and software. Just like Xperia Z1, Sony has included free gits with Xperia Z1 Compact aka Xperia Z1C it you pre-order it now. Previously we noticed Phone4U in UK is has listed Xperia Z1 Compact aka Xperia Z1C for pre-order as carrier based contract device ( on Vodafone, EE and Orange ), giving £119 worth Sony Wireless Speaker SRS-BTX300 free with it. Now you can order your Sony Xperia Z1 Compact aka Xperia Z1C officially from Sony stores in Europe so it will hit rest parts of world also for purchasing. 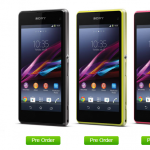 Many online retailers like Clove UK and Amazon has also listed Xperia Z1C for pre-order now. At present you can pre-order Sony Xperia Z1 Compact aka Xperia Z1C in UK, Spain, Netherlands, Poland, Sweden, Italy and Germany. 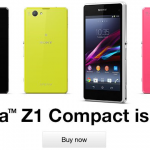 Xperia Z1 Compact aka Xperia Z1C Price in UK £449, on pre-order you get Sony SmartWatch 2 SW2 free with it. It is expected to ship at the end of Feb 2014. Xperia Z1 Compact aka Xperia Z1C Price in France €549 and you get a refund of €50 on pre-ordering it now. Expected to ship at the end of Feb 2014. 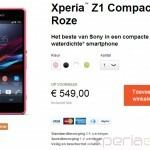 Xperia Z1 Compact aka Xperia Z1C Price in Netherlands €549, on pre-order you get Sony SmartWatch 2 SW2 for €1 only. Expected to ship at the end of Feb 2014. Xperia Z1 Compact aka Xperia Z1C Price in Spain €549, on pre-order you get Sony Wireless Headset DR-BTN200M for €1 only. Expected to ship at the end of Feb 2014. 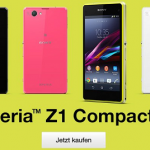 Xperia Z1 Compact aka Xperia Z1C Price in Germany €499, on pre-order you get Sony Wireless Headset DR-BTN200M for €1 only. Expected to ship at the end of Feb 2014. Xperia Z1 Compact aka Xperia Z1C Price in Italy €499, on pre-order you get Sony Wireless Headset DR-BTN200M for €1 only. Expected to ship at the end of Feb 2014. Xperia Z1 Compact aka Xperia Z1C Price in Sweden 4695 kr, on pre-order you get Sony Wireless Headset DR-BTN200M for 1 kr only. Expected to ship at the end of Feb 2014. Xperia Z1 Compact aka Xperia Z1C Price in Poland 1999 zł, on pre-order you get Sony Wireless Headset DR-BTN200M for 1 zł, only. Expected to ship at the end of Feb 2014. Sony has priced Xperia Z1 Compact at the same price tag in which flagship devices are priced, but we should not forgot the Xperia Z1 Compact features exactly same hardware which Xperia Z1 supports so it’s obvious that it will fall in expensive phones price tag. Xperia Z1 Compact under the name of Xperia Z1 F is available in Japan and soon it will come to China as Sony M51w on 14 Jan hopefully as Sony has organised a press conference on the very same day. 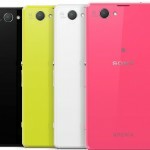 As Sony launched Xperia Z1 separately in India, so we can expect this time also Sony will organize a press conference for launching Xperia Z1 Compact aka Xperia Z1C soon and it should be priced around 35000 INR above, we assume so Xperia Z1C Price in India and release date is still unknown officially. Follow the Xperia Z1C aka Xperia Z1 Compact Facebook Fan page. 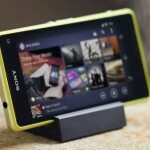 Pre-Order Xperia Z1C aka Xperia Z1 Compact in UK from Phones4U – Get £119 Sony Wireless speaker free. So what do you think, has Sony priced Xperia Z1 Compact aka Xperia Z1C decently ? Will you be buying it, let us know. Drop your comments below.